Institutions, corporates, construction companies, hotels, sports coaches, beauty salons, individuals. It is an employer’s responsibility to ensure they have sufficient qualified First Aiders to fulfil their safety needs at all times. In many instances you are interested in first aid because it is a legal requirement from Dubai Municipality, because you need it to renew your trade licence or because you need it to pitch for certain contracts. Whatever the reason it is always a good idea to get first aid training. Skills practice and testing during course to ensure students demonstrate competency performing skills. Heart Saver First Aid with CPR and AED Student Workbook which includes Heart Saver First Aid reference guide, Adult CPR and AED reminder. The Perfect Help trainers are all internationally accredited first aid instructors and qualified nurses with hospital experience. All instructors have been approved by Dubai Corporation for Ambulance Services (DCAS), the regulatory body for First Aid in Dubai. Any member of a professional organization who wishes to assist fellow workers or clients in an emergency. This certificate is recognized by Department of Economic Development (DED) at the time of license renewal, and is recognized by government authorities when presented at time of tender. This depends entirely on the size of your company, industry sector and how much you value the safety of your staff, customers and materials. If you are a general trading company, we recommend to have at least 2 (two) First Aiders to always have 1 (one) on duty. Please call us for more information on required numbers. Does this course satisfy all UAE legal requirements for hotels, construction companies, beauty salons, and other corporations? Yes, the AHA (American Heart Association) Certification is recognized by Dubai Municipality, Department of Economic Development (DED) and Dubai Corporation for Ambulance Services (DCAS). Your certificates need to be valid, always check expiry dates! It is up to you! We can teach in your company venue, or at our training centre on Sheikh Zayed Road, Commercial Bank of Dubai Building. For a detailed location map and instructions please visit the “Contact Us” section on the website. Yes, we teach 6 days a week (Saturday to Thursday) and can adapt our timings to suit your needs. Please call us on +971 (0) 4 343 3799 for more information. It is an employer’s responsibility to ensure they have sufficient qualified First Aiders to fulfill their safety needs at all times. In many instances you are interested in first aid because it is a legal requirement from Dubai Municipality, because you need it to renew your trade license or because you need it to pitch for certain contracts. Whatever the reason it is always a good idea to get first aid training. Certificate of Completion will be available within 14 days post training date and can be collected at our training center in Commercial Bank Building (Sheikh Zayed Road), near FGB Metro Station. We can issue you an email to confirm completion, while you are waiting for your certificate. Please note: Students are required to provide a passport copy for registration purposes. Our Courses are designed for any member of a professional organization who wishes to assist fellow workers or clients in an emergency. This certificate is recognized by DED at the time of license renewal, and is recognized by government authorities when presented at time of tender. This depends entirely on the size of your company, industry sector and how much you value the safety of your staff, customers and materials. If you are a general trading company we recommend you have at least 2 (two) First Aiders to always have 1 (one) on duty. Please call us for more information on required numbers. Yes, we do offer special rates for groups. Please call us on +971 (0) 4 343 3799 for more information. We can teach in your company venue, or at our Training Centre in Commercial Bank Building (Sheikh Zayed Road), near FGB Metro Station. For a detailed location map and instructions, please visit the “Contact Us” section on the website. We come to offices in all Emirates to teach for groups and require at least 10 students per session. The UAE legal framework is very conscious of health and safety at work which is why there are a number of compulsory trainings that staff will need to follow. If you are visiting this page you may have become aware of your legal requirement to do so. 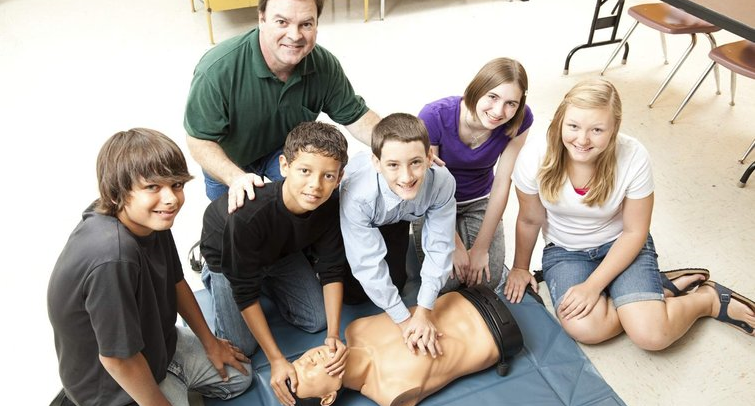 The Perfect Help is proud to offer First Aid Trainings for companies and hotels. You can choose from our scheduled AHA (American Heart Association) and Highfield Emergency First Aid at Work courses in our training center or call us to schedule a course specifically for your team. Either way you can expect the best instruction and a respective 2 and 3 year qualification that will keep your team safe. We offer two choices of first aid courses for corporates, all certified by Dubai Corporation for Ambulance Services (DCAS) and Dubai Health Authority (DHA). You can choose between the American method with the American Heart Association or the British standard with Highfield. Our courses are taught in an entertaining yet educational video based manner. Courses can be held on your premises or in our training facility. For group bookings, please call us at +971 (0) 4 343 3799.